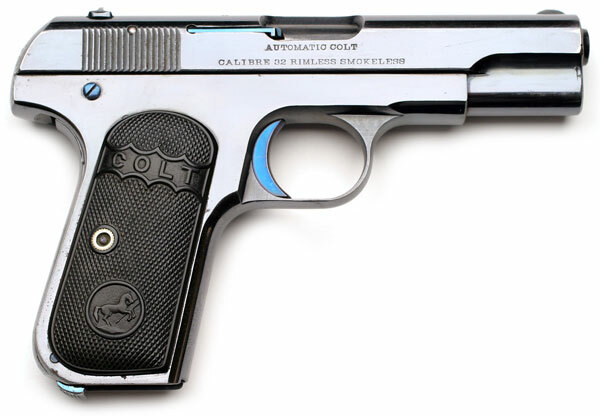 Colt Model 1903 Pocket Hammerless .32 ACP Serial Number 106716 Early Type III (left side) - with integrated barrel bushing and 3 3/4" barrel. (.32 sn range 105001 - 468000) (.380 sn range 6251 - 93000) This example, serial number 106716 (ca. 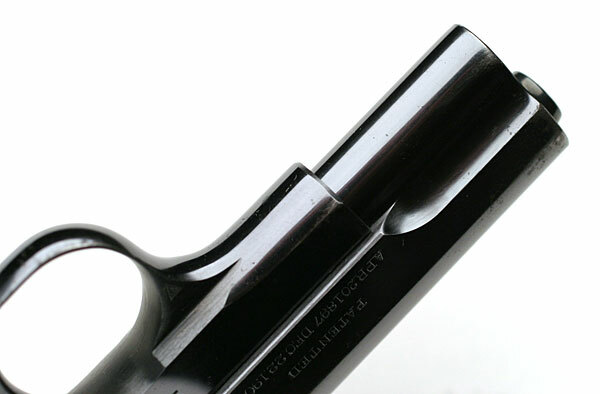 1910) has the early high polish finish and turquoise blue trigger, thumb safety, thumb safety screw, extractor, grip screw, magazine release and slide plug. It retains much of its original high polish blue finish. It has the Type I checkered Hard Rubber grips with the Rampant Colt in a circle at the bottom of each grip. Full blued magazine has an unmarked floorplate. Pistol was a single gun shipment to firearms dealer W.F. Sheard, Tacoma, Washington on November 11, 1910. 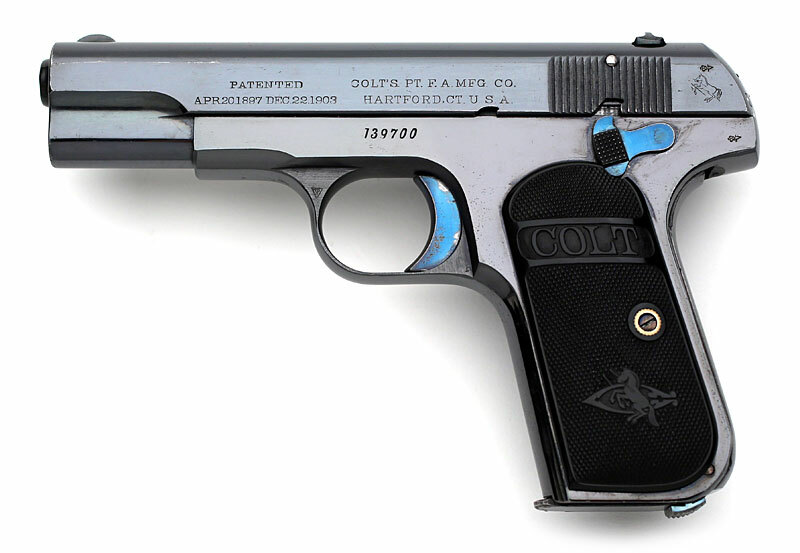 Colt Model 1903 Pocket Hammerless .32 ACP Serial Number 106716 Early Type III - Fire blue slide plug on 106716. 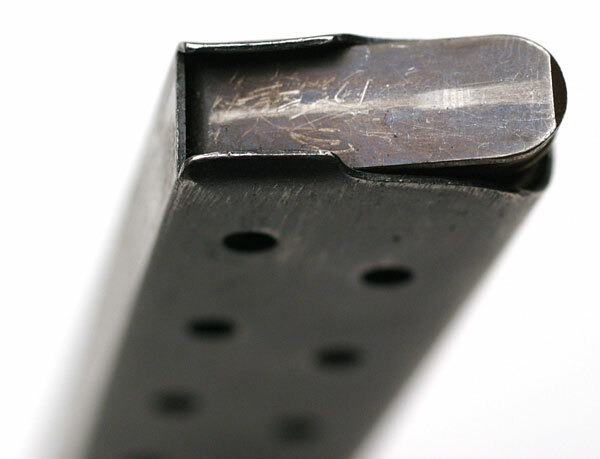 The most distinguishing characteristic between the Type II and the Type II pistols is the elimination of the separate barrel bushing that was present on both the Type I and Type II pistols. 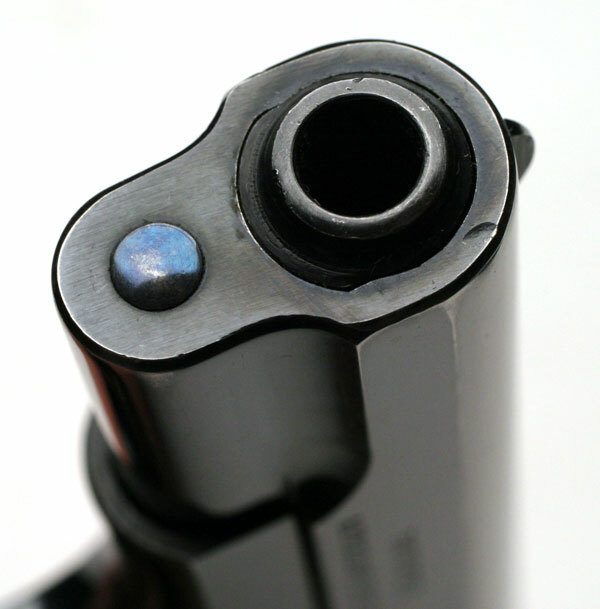 The slide plug was replaced with a smaller version and the barrel had an integrated bushing. Colt Model 1903 Pocket Hammerless .32 ACP Serial Number 124522 Type III (left side) - with integrated barrel bushing and 3 3/4" barrel. (.32 sn range 105001 - 468000) (.380 sn range 6251 - 93000) This example, serial number 124522 (ca. 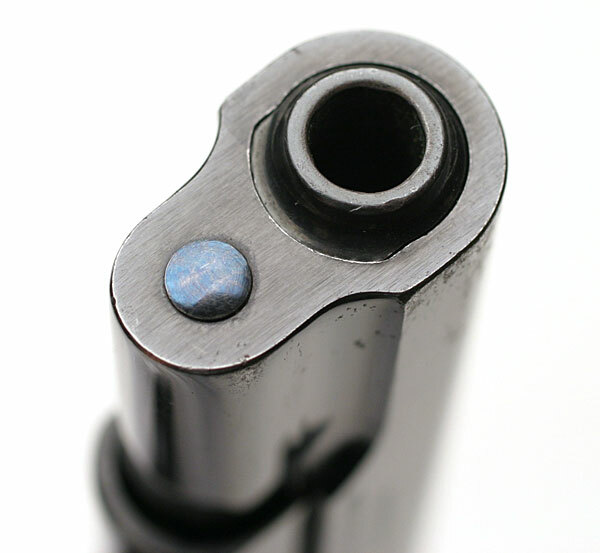 1911) has the early high polish finish and turquoise blue trigger, thumb safety and extractor. It retains much of its original high polish blue finish. It has the Type II checkered Hard Rubber grips with the Rampant Colt and Stylized "C" at the bottom of each grip. 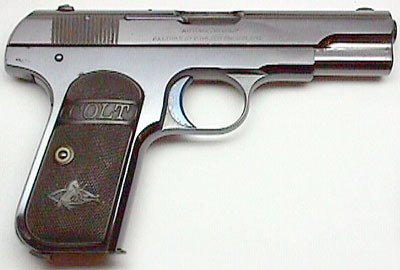 Colt Model 1903 Pocket Hammerless .32 ACP Serial Number 124522 Type III (right side) - External screw for thumb safety has been eliminated. 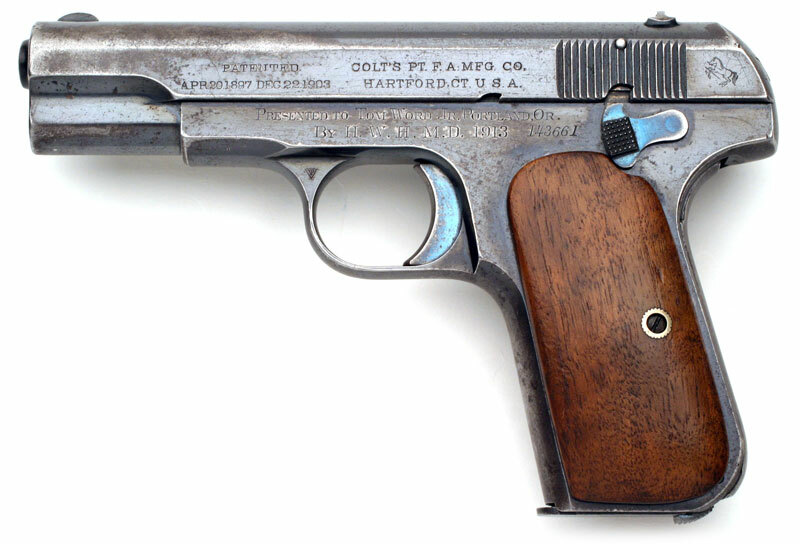 Colt Model 1903 Pocket Hammerless .32 ACP Serial Number 135677 Type III (left side) One of ten shipped to Simmons Hardware Co., Philadelphia, PA, August 13, 1912. 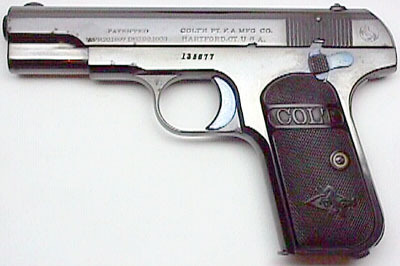 Colt Model 1903 Pocket Hammerless .32 ACP Serial Number 143661 Type III Factory Special Order (left side) - shows second rampant Colt variation on left rear of slide. Horse is approximately the same size and style as seen in the first variation, but the circle around the horse and the partial globe on which the horse is standing has been omitted. (ca. 1912-1913). 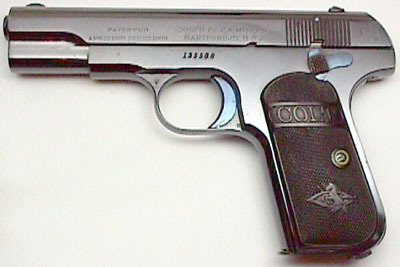 Colt Model 1903 Pocket Hammerless .32 ACP Serial Number 143842 Type III (left side) - shows second rampant Colt variation on left rear of slide. Horse is approximately the same size and style as seen in the first variation, but the circle around the horse and the partial globe on which the horse is standing has been omitted. (ca. 1912-1913). 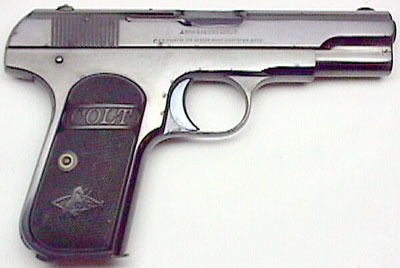 Colt Model 1903 Pocket Hammerless .32 ACP Serial Number 152199 Type III circa 1913 (left side) - pictured on top of original holster which accompanied the gun. 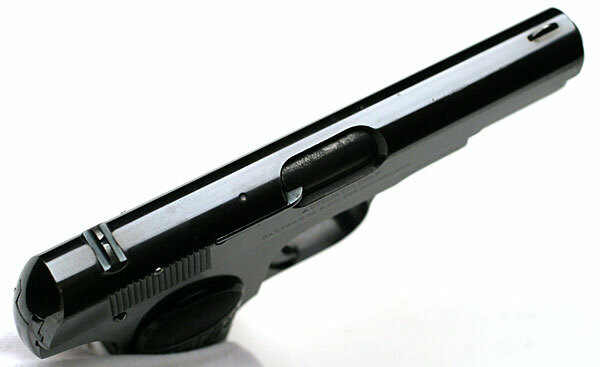 This example is a late high polish transition gun as some of the small parts have the turquoise blue (thumb safety, extractor, magazine release, grip screw, rear sight, slide plug) and the trigger does not. The blue finish on the trigger matches the finish on the slide and frame. 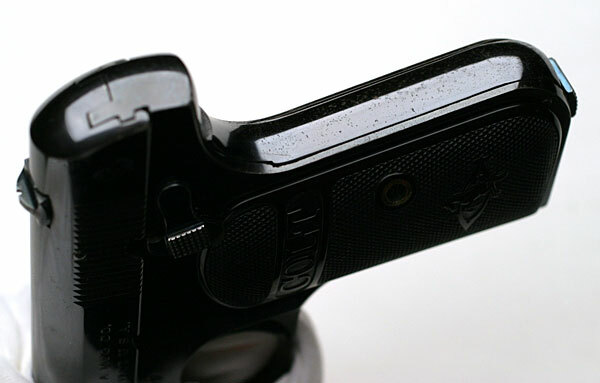 Colt Model 1903 Pocket Hammerless .32 ACP Serial Number 152199 Type III (left side) - close up of Rampant Colt on partial globe variation that followed the earlier style Rampant Colt logo without circle. 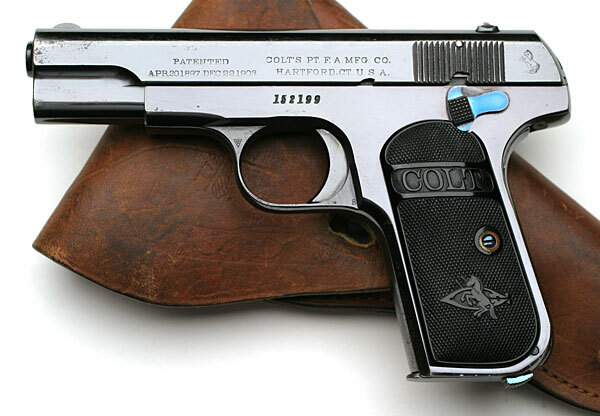 Colt Model 1903 Pocket Hammerless .32 ACP Serial Number 152199 Type III (right side) - grip on left side is a period replacement with the grip type that was introduced around 1916. 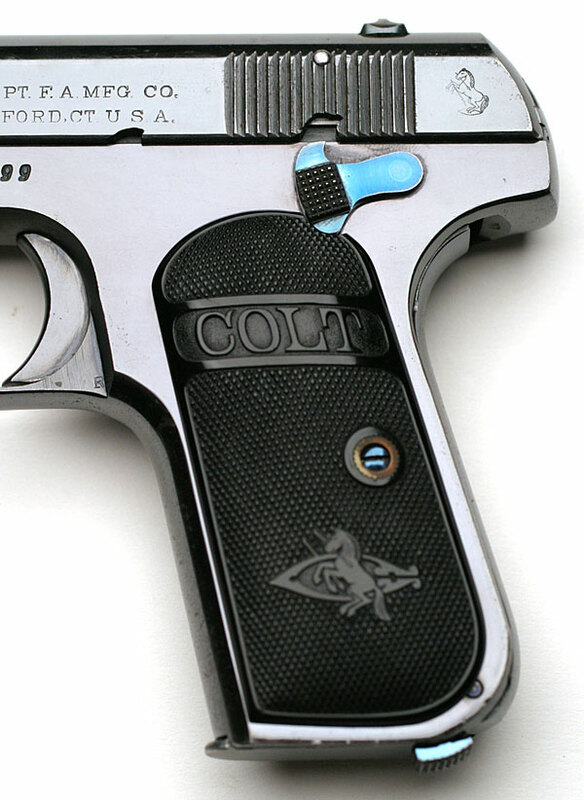 Colt Model 1903 Pocket Hammerless .32 ACP Serial Number 152199 Type III - barrel is full blued and chamber visible through the ejection port is blue as well. 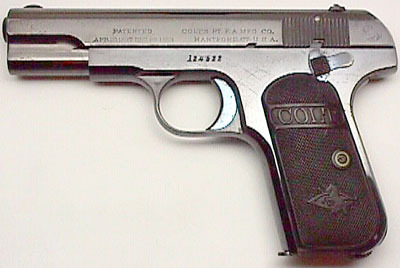 Colt Model 1903 Pocket Hammerless .32 ACP Serial Number 152199 Type III (right side) - view of back end of the gun and grip safety. Note the turquoise blue on the magazine release. 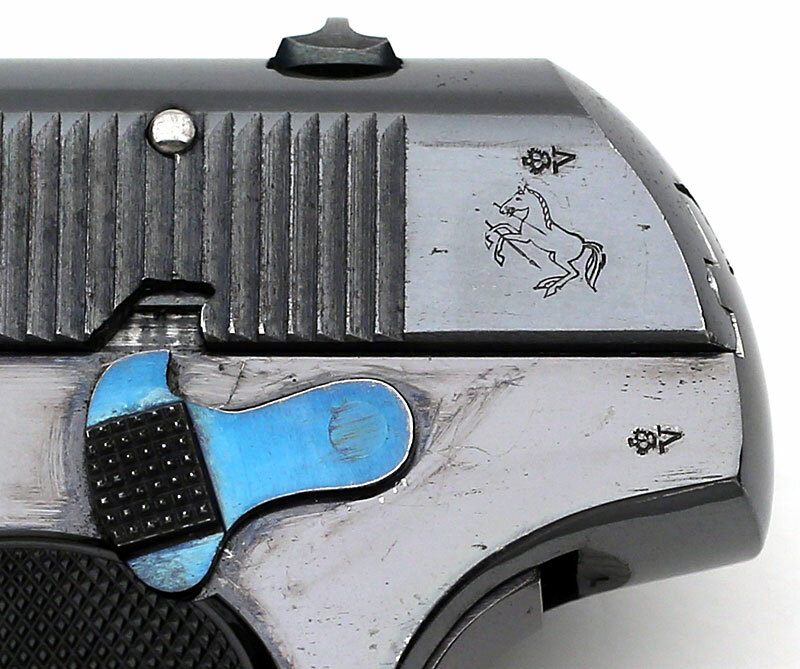 Colt Model 1903 Pocket Hammerless .32 ACP Serial Number 152199 Type III - plug at the end of the slide is turquoise blue. 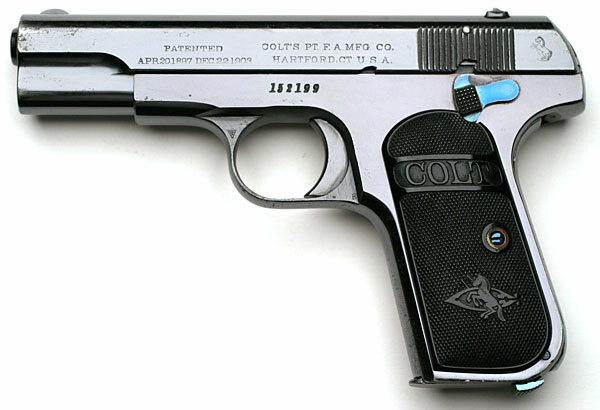 Colt Model 1903 Pocket Hammerless .32 ACP Serial Number 152199 Type III - underside view of the slide and frame. 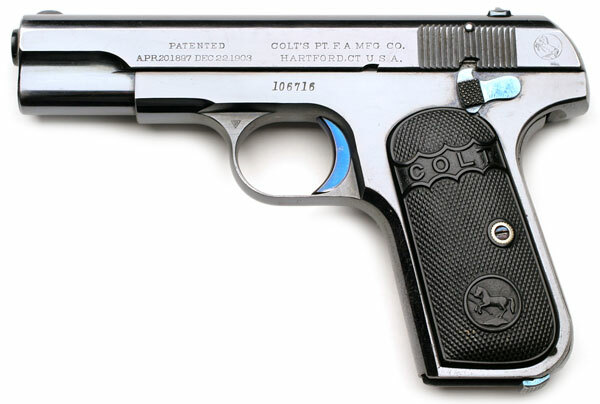 Colt Model 1903 Pocket Hammerless .32 ACP Serial Number 152199 Type III - Early style unmarked full blued magazine. Colt Model 1903 Pocket Hammerless .32 ACP Serial Number 152199 Type III Magazine - unmarked floorplate. 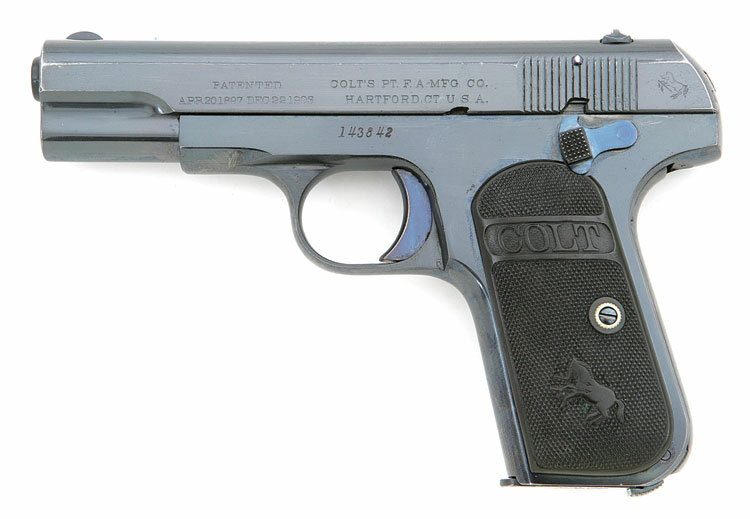 Colt Model 1903 Pocket Hammerless .32 ACP Serial Number 152199 Type III Magazine - Feed ramp has traces of turquoise blue.